With thousands of archaeological sites, Jerusalem is one of the most excavated cities on the planet and to walk its streets is to walk through a thousand years of history. This ancient city has been fought over more than any other place. It has been conquered, destroyed and rebuilt many times and Hadrian played a significant role in Jerusalem’s physical development. In AD 130, on his grand tour of the eastern part of the Roman Empire, Hadrian visited the devastated city of Jerusalem, accompanied by his young lover Antinous. He established a new city on the site of the old one which was left in ruins after the First Roman-Jewish War of 66–73. Drawing of the reverse of a coin from Colonia Aelia Capitolina. The reverse depicts Hadrian as founder ploughing with bull and cow the sulcus primigenius (aboriginal furrow) that established the colony’s pomerium (sacred boundary). The vexillum, or military standard, in the background represents the veteran status of the colony’s new inhabitants. The legend, COL[ONIA] AEL[IA] KAPIT[OLINA] COND[ITA], translates “The founding of Colonia Aelia Capitolina”. Exactly when the construction of Colonia Aelia Capitolina began is still a matter of debate. Some scholars, relying on the writings of Cassius Dio, contend that the name change and the beginning of the construction of Aelia Capitolina occurred in connection with Hadrian’s visit in 130, perhaps even setting off the Second Jewish Revolt. Others, relying on the writings of the 4th-century church father Eusebius, propose that the change of name occurred only after the Second Jewish Revolt was suppressed in 135. However, finds from recent excavations of the Eastern Cardo suggest that not only the foundation of the Roman city predated the Second Jewish Revolt but that the establishment of the city preceded the uprising by about a decade. The 7th century Christian Chronicum Paschale lists several other buildings in Aelia Capitolina; two public baths, a theatre, a nymphaeum of four porticoes (perhaps the Pool of Siloam), a triple celled building (the Capitolium? ), a monumental gate of twelve entrances (a circus? ), and a quadrangular esplanade. However, none of these buildings has been archaeologically located. On the basis of Jerusalem’s depiction on the 6th century AD Madaba map (mosaic depicting the layout of Jerusalem, discovered in a Byzantine church in Madaba, Jordan), it is usually assumed that from the Damascus Gate in the north of the city (Porta Neapolitana) ran two wide colonnaded streets, the Western and Eastern cardos (Cardo Maximus & Lower Cardo). The Cardo Maximus is shown in the centre of the mosaic with a pillared colonnade on both sides running south to the camp. Another smaller eastern street was connecting the north gate to the south part of the city, passing between the temple mount and the upper city and reaching the Dung Gate. It is indicated by a single line of columns crossing the top side of Jerusalem. Paved and lined with columns, the Cardo Maximus was the main road that ran through the Roman and Byzantine city and also served as the centre for the local economy. Major sections of this 1900-year-old street have been excavated and are reused in today’s Jewish Quarter in the Old City of Jerusalem. The entire roadway was originally 22 meters wide (40 feet) while the road itself was 5 meters wide (16 feet) with collonaded and covered passageways on both sides to protect pedestrians from traffic and the heat of the sun. Shops lined the colonnades in its southwestern section. The excavation of the Western Cardo by Professor Nahman Avigad of the Hebrew University began in 1975 and lasted two years. A 200 m long section of the cardo was exposed 4 meters below the present street level. Today visitors can get a good idea of how the cardo looked like just beyond the entrance to the Jewish Quarter where two sections of the main street have been reconstructed. While some of the column bases were found in situ, most of the architectural features were reused in later structures that lined the cardo. However, the Hadrianic Western Cardo did not stretch this far south until centuries later. This portion dates to the time of Emperor Justinian. During the 6th century AD, the city became an important Christian centre with a rapidly growing population. The southern section was built to link the cardo to the two main churches of Byzantine Jerusalem, the Holy Sepulcher and the Nea Church. This impressive Hadrianic gateway, built with Herodian stones, consisted of a large arched passageway – situated beneath the opening of today’s Damascus Gate – flanked by two smaller, lower arches. It was protected on both sides by two guard towers. However, by the time the Madaba Map was made, the side passageways were blocked and only the central one was still in use. In front of the gate was a broad plaza, in the centre of which stood a column supporting a statue of Hadrian at its top. Only the eastern entrance of the gate with its flanking tower has survived which can be seen below the modern raised walkway entering the Damascus Gate. The Roman gate of Aelia Capitolina has been restored and opened to the public; upon descending below the bridge leading to the Ottoman Damascus Gate, one can enter once again through this early gate into the city. The central arch was flanked by two smaller arches, one of which can still be seen inside the Ecce Homo Church. The second small arch was incorporated in the 16th century into an Uzbek dervishes monastery on the other side of the Via Dolorosa street, but this was later demolished, taking the arch with it. Hadrian established two forums in Aelia Capitolina, one north of the Temple Mount and the other on the western side of the city. Both were large, open, paved spaces surrounded by temples and public buildings. Only the northern forum has been located with certainty. At the start of the 20th century, the French religious-archaeologist Father Louis-Hugues Vincent discovered a large expanse of ancient pavement immediately beneath the Convent of the Sisters of Zion. He declared that it was the “lithostrotos” of John’s gospel (the location of Pontius Pilate’s judgment of Jesus). Archaeology has proven conclusively that the pavement was associated with the arch and was part of the Hadrianic forum. At the excavation site in the Western Wall plaza, archaeologists also uncovered two small streets that ran perpendicularly and led east from the cardo toward the Western Wall of the Temple Mount. This discovery may indicate that, during the early 2nd century AD, the Temple Mount area had something important standing in the place where the destroyed Second Temple once stood. 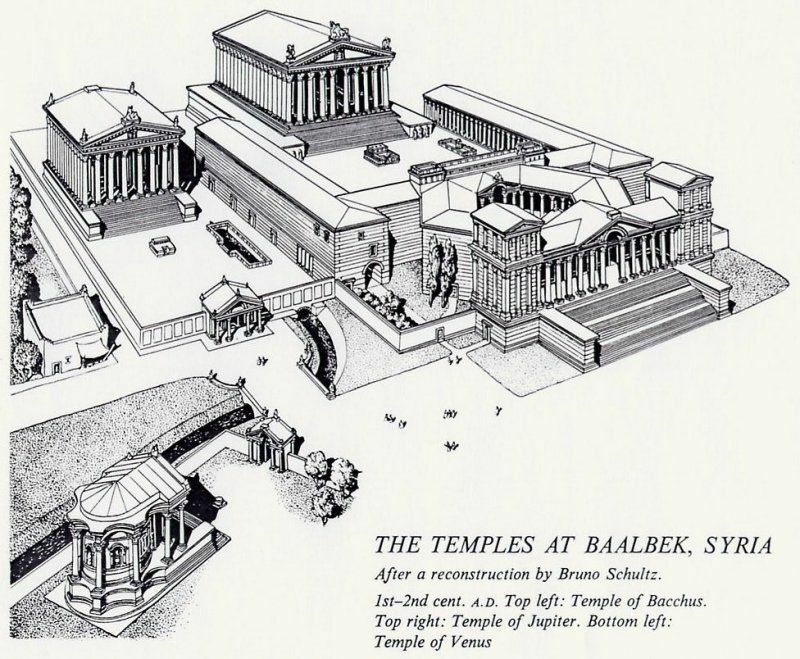 Some scholars have proposed that there was once a temple – to Jupiter Capitolinus or some other Roman deity or combination of deities – that was built at the site of the Second Temple after Jerusalem had been transformed into a pagan city. In addition to Dio Cassius, other written sources implied that such was the case, but little archaeological evidence had ever been recovered to confirm or support this claim until the discoveries of these two small streets. However, it has been thought that the pilgrim may have mistaken the statue of Antoninus Pius with that of Hadrian. This can be revealed by an inscription which today appears upside-down on the wall above the Double Gate located on the southern Temple Mount Wall. This inscription, reused by later Islamic builders, could have been engraved upon the pedestal of Antoninus Pius’ equestrian statue. In AD 398, Saint Jerome‘s commentary on Matthew mentioned that an equestrian statue of Emperor Hadrian was still standing directly over the site of the Holy of the Holies, then consecrated to Jupiter Capitolinus. In digs conducted in 1964 near the Church of Saint Anne, archaeologists discovered the remains of Hadrian’s Temple of Asclepius – the god of healing – and Serapis. Between 150 BC and AD 70, a popular healing centre developed on the site of the Pool of Bethesda, the water reservoirs that supplied water to the temple mount in the 3rd century AD. A water cistern, baths and grottoes were arranged for medicinal or religious purposes. In the mid 1st century AD, Herod Agrippa built a popular healing centre, the asclepeion. When Hadrian rebuilt Jerusalem as Aelia Capitolina, he expanded the asclepeion into a large temple to Asclepius and Serapis. Several votive offerings were discovered at the site of the temple including a small aedicula with a snake – the symbol of Asclepius – and wheatears, a statuette representing a woman getting ready for bathing as well as a Roman coin minted in Aelia Capitolina figuring the god Serapis. 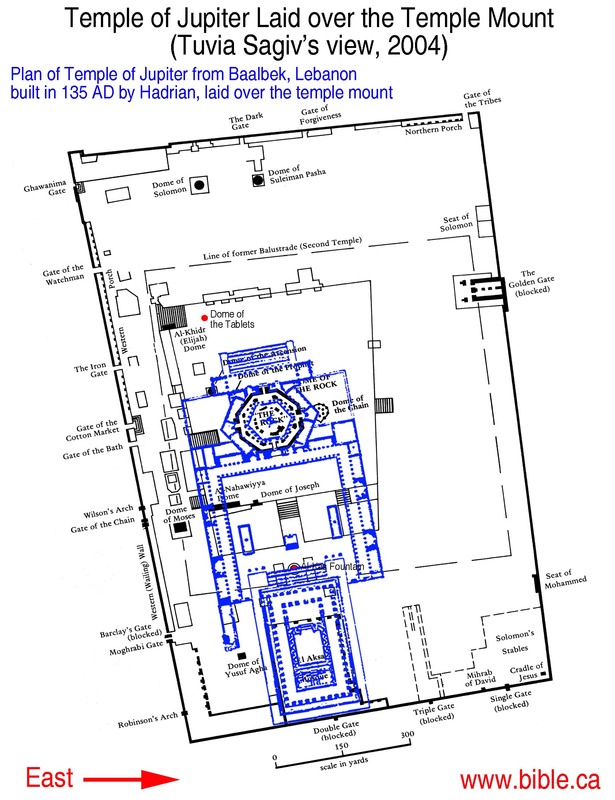 The Hadrianic temple was surrounded by a temenos (a sanctified area, marked by a protective wall) with a main entrance on the Cardo Maximus. 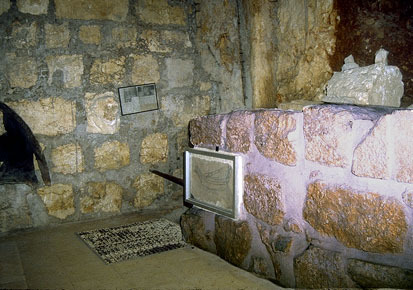 In the 1970s, in the Chapel of Saint Vartan deep beneath the Church of the Holy Sepulchre, archaeologists discovered part of the original ground level and the protective walls of Hadrian’s temple enclosure (see image here). 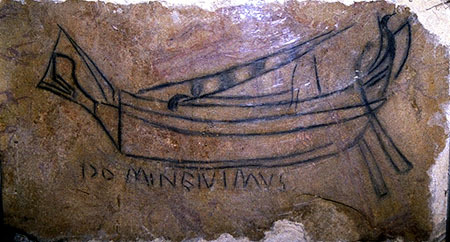 One of these walls has a stone etched with a merchant ship and an inscription “DOMINE IVIMVS” which translates “Lord, we went” (see image here). It is estimated that this stone dates from before the completion of the Byzantine church. It seems to indicate that the site of the Church of the Holy Sepulchre was regarded as the authentic Golgotha even when a pagan temple stood there. City coins were issued from the time of Hadrian to that of Valerianus (260) but are especially plentiful from the times of Antoninus Pius, Marcus Aurelius, Elagabalus, and Trajan Decius. The 206 coin types depict the many gods worshipped in Aelia Capitolina: Serapis, Tyche, Dionysus, the Dioscuri, Roma, Ares, Nemesis are all to be found in addition to the Capitoline Triad. Aelia was a quiet provincial city but great events such as the imperial visit of Septimius Severus in AD 201 also took place. It was commemorated by an inscription discovered near the Western Wall. On this occasion, the colony received the honorary title “Commodiana Pia Felix”, appearing for the first time on the coins of Geta. 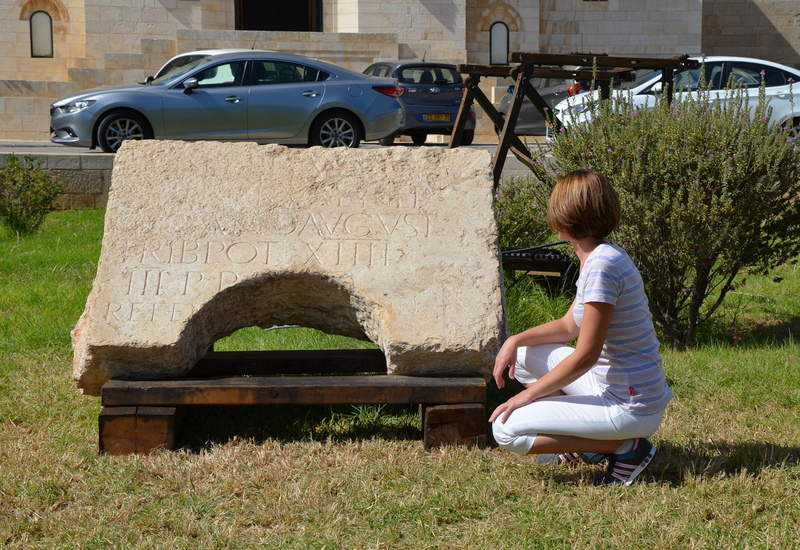 Recently, on Wednesday 22nd October 2014 (the day I arrived in Jerusalem), a rare find of historical significance was unveiled and displayed to the public by the Israel Antiquities Authority: a large slab of limestone engraved with an official Latin inscription dedicated to Hadrian. 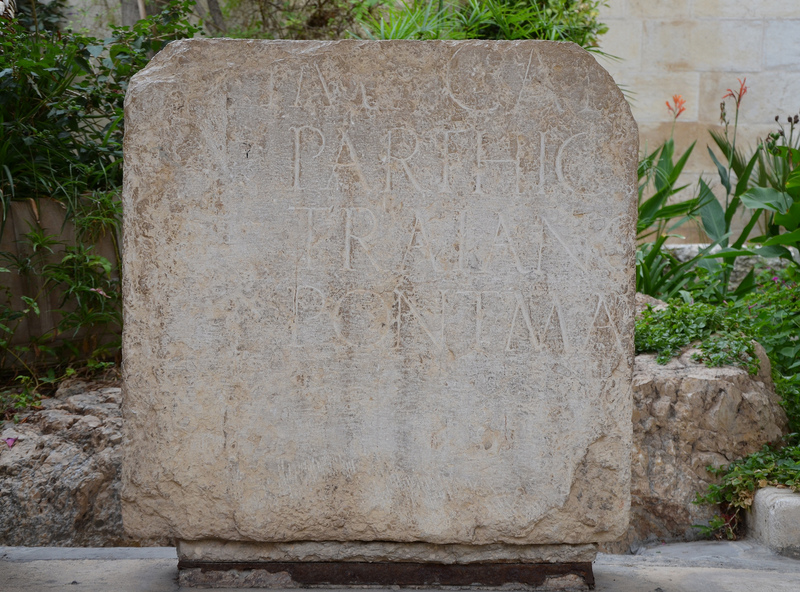 The fragmented stone, roughly a meter wide, with Latin text inscribed in six lines, might have been part of a monumental arch dedicated Hadrian in 130 in honour of his imperial visit. Researchers believe this is among the most important Latin inscriptions ever discovered in Jerusalem and may shed light on the timeline of Jerusalem’s reconstruction. Their analysis revealed that this inscription is the right half of an inscription discovered nearby in the late 19th century by the French archaeologist Charles Clermont-Ganneau. The inscription slab is currently on display in the courtyard of Studium Biblicum Franciscanum Museum. During the reign of Constantine the Great, in the fourth century AD, Jerusalem became an important Christian city. The Church of the Holy Sepulchre was built on the site of the Temple of Aphrodite and the Basilica of Holy Zion at the south of the Western Hill. Two and a half centuries later, Justinian built the massive Nea Church and extended the Roman Cardo further south. The Temple Mount was left in ruins. Very interesting, thank’s for posting! I’ve been to Jerusalem many times, first time in 1985, last time, in 2013. Will def go back, and hopefully many more times. This info will be great to have next time in Jerusalem. thanks! I really look forward to these pieces. Can you recommend me some literature about Severus and Serapis in Aelia Capitolina? Thank you for this brilliant report! MUY BUENISIMA PRESENTACION Y EXPOSICION CON HECHOS, GRACIAS POR LA EXTENSION DE CONOCIMIENTOS, PUES DE VISITANTES FALTAN EXPLICACIONES COMO ESTAS. Hello , I really like your follow hadrian blog. I keep asking people I meet on bible and archeology websites how long it would have taken for news of a rebellion in Iudea to reach Sextus Julius Severus in York ( via wherever Hadrian was at the time presumably) and then the time it would have taken to travel from York to Iudea but nobody answers ? Really enjoyed reading this again and the Antonine coins is something I recognise from his wall in Scotland . Hadrian , Antonine and Severus are all noted as having been in Britannica as well as the middle East . Is there any clues as to why there was a hive of Roman activity in Jerusalem before Constantine’s mother dug up 3 crosses because it doesn’t strike me as a being a land – minus any precious metals and minerals – that would have justified it ? Not somewhere that would make the Roman Empire wealthy basically. Fantastic post on Hadrian’s Jerusalem. Thank you for all the helpful info!